Water Monster or Monster Wave? Both Lake Champlain in North America and Loch Ness in Scotland have been the location of many sightings of what appears to be a strange underwater creature. While some cryptozoologists think they may be surviving plesiosaurs from the age of the dinosaurs, a group of physicists believe the sightings at these lakes may be of something else entirely. Both Loch Ness and Champlain are unusually long, deep and narrow bodies of water compared to other lakes. Cryptozoologists have used this to support their theories that these bodies of water are the homes of monsters. A deep lake gives a mysterious creature a place to hide, right? Both Loch Ness and Champlain also have a deep layer of cold water, called the hypolimnion, under a layer of warm water, called the epilimnion. Perhaps these characteristics, suggest supporters of the lake monster theory, are needed for the creature's survival. The long, deep and layered nature of these two lakes also make them susceptible to another strange phenomenon. A wave called a seiche. A seiche is a standing wave in an enclosed body of water, such as a lake. The term "standing wave" means that the wave goes back and forth between two fixed boundaries. You can observe a standing wave whenever you watch a guitar string being plucked. The wave goes back and forth from one fixed point on the guitar string to another. In the case of Loch Ness and Champlain, the fixed points are the farthest ends of the lakes. The wave moves back and forth between them. To picture what is happening in the lakes, imagine what goes on when you sit at one end of a bathtub and suddenly get up. The water your body displaced at one end of the tub comes rushing in to fill the void. As the wave hits the end of the tub, it turns around and heads back to where it originated. This wave goes sloshing back and forth in the tub many times before it loses energy and levels out. By standing up, you have created a seiche in your tub. The same kind of wave occurs in the lakes. In the case of Lake Champlain, the wave may be from 30 feet to 300 feet high! Why does nobody notice a wave that high in the lake? Because the wave doesn't happen on the surface, but underwater. This huge wave moves along the boundary between the warm water layer and the cold water layer. The warm and cold layers of these lakes do not usually mix. The boundary is very much like the boundary between the surface of the lake and the air above it. In the same way the waves we usually see move along the water-air boundary, the giant seiche wave moves along the warm water-cold water boundary. A giant 300-foot wave might be roaring along underneath the water, while the surface is smooth and placid. What starts these waves? Scientists think that prevailing winds running the length of the lake can cause a build-up of the epilimnion (warm water) at the end forcing the hypolimnion (cold water) to the opposite end. When the wind stops, the warm water on the surface starts flowing back to its regular position. This is very much like getting out of the bathtub in our example. The cold water layer then suddenly rushes back to the end the warm water vacated. This giant, powerful wave of water then bounces back and forth between the ends of the lake to make a seiche. It can take 4 days for the wave to go the entire 60-mile length of the main part of Lake Champlain. What does this have to do with lake monsters? Skeptics of the Champlain and Loch Ness monsters argue that this powerful, but unseen wave, throws stuff laying around on the bottom of the lake up to the surface. This might make an old log appear to jump out of the water or move across the surface. An moving log could resemble a living creature from a distance. 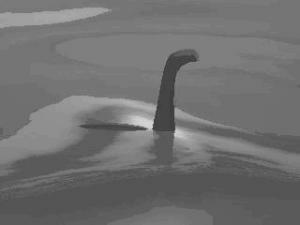 Skeptics also point out that most sightings of the Lake Champlain monster occur during the summer. While some of that may be the result of more tourists at the lake which increases the chance of somebody observing the creature, it is also the time of year when the seiches are most likely to occur. So far nobody has been able to prove that the water monsters in these lakes are giant waves. Either way it is safe to say that something big lies under the surface at both Loch Ness and Lake Champlain.